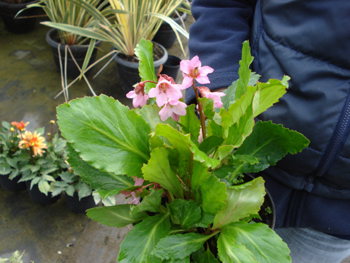 Bergenia, pigsqueak or elephants ear are nice leafy ground cover or clump forming plants. One of the first perennials to flower in early spring from large leathery lime green leaves. The flowers are usually a shade of pink and stand up like candles looking like slim hyacinths. They keep most of the foliage all year and in truth when they flush the new growth in spring you are ready for the change as they start to look tired. They look great at the front of the border as they do not grow very tall. Any reasonable soil and position is fine. Called pigsqueak because when you squash the leaves together they squeak or elephants ears for the size of their leaves.